Two weeks after the assassination of Martin Luther King in 1968, Black priests declared the Catholic Church in the United States “a white racist institution.” This provocative proclamation sparked a revolution that known as the Black Catholic Movement, one with the potential to forever change the face of U.S. Catholicism. Dr. Matthew Cressler will unpack the history of this movement and illuminate its implications for us today. Dr. Matthew J. Cressler is assistant professor of religious studies at the College of Charleston (South Carolina). His teaching and research areas include African American religions, Catholic studies, religion in America, and theory in the study of religion, with a special interest in the intersection of religion, race, and nationalism. 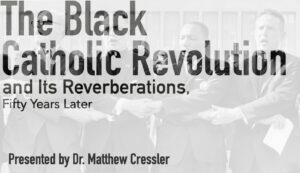 Dr. Cressler specializes in Black Catholic history and has published Authentically Black and Truly Catholic: The Rise of Black Catholicism in the Great Migration (NYU Press, 2017).